CHICAGO – In our latest adventure/comedy edition of HollywoodChicago.com Hookup: Film, we have 40 admit-two movie passes up for grabs to the advance Chicago screening of “The Way” with Emilio Estevez and Martin Sheen from writer/director Emilio Estevez! 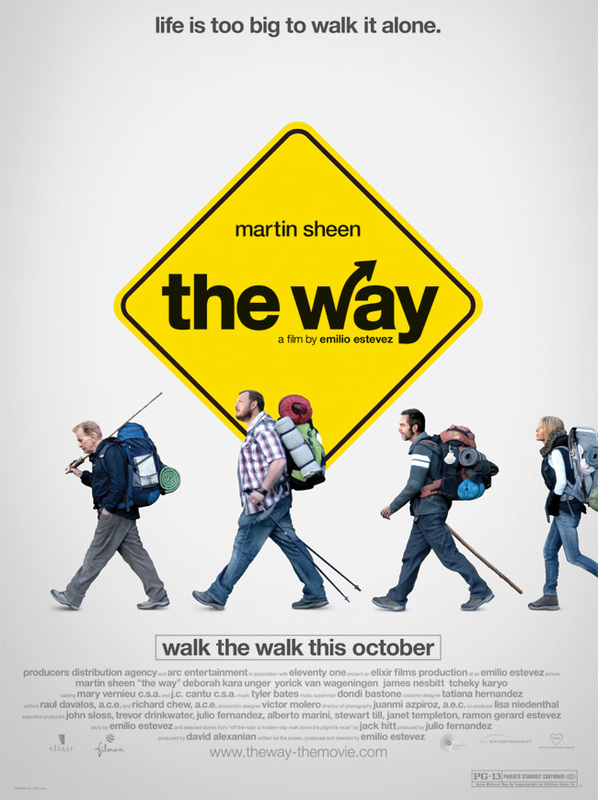 “The Way” also stars Deborah Kara Unger, Yorick van Wageningen, James Nesbitt, Tchéky Karyo, Spencer Garrett, Ángela Molina, Carlos Leal, Simón Andreu, Antonio Gil, Nacho Estévez, Santi Prego, Eusebio Lázaro and Joan Díez. The film opens on Oct. 7, 2011. To win your free pass to the advance Chicago screening of “The Way” courtesy of HollywoodChicago.com, just answer our question below. That’s it! This advance screening is on Wednesday, Oct. 5, 2011 at 7 p.m. in downtown Chicago. Directions to enter this Hookup and win can be found beneath the graphic below. The movie poster for “The Way” with Emilio Estevez and Martin Sheen from writer/director Emilio Estevez. “The Way” is a powerful and inspirational story about family, friends and the challenges we face while navigating this ever-changing and complicated world. Martin Sheen plays Tom: an American doctor who comes to St. Jean Pied de Port, France to collect the remains of his adult son (played by Emilio Estevez). Tom’s son was killed in the Pyrenees in a storm while walking The Camino de Santiago (also known as The Way of Saint James). Rather than return home, Tom embarks on the historical pilgrimage to honor his son’s desire to finish the journey. What Tom doesn’t plan is the profound impact the journey will have on him and his California bubble life. Inexperienced as a trekker, Tom soon discovers he will not be alone on this journey. On “The Way,” Tom meets other pilgrims from around the world – each with their own issues and looking for greater meaning in their lives. Tom meets a Dutchman (Yorick van Wageningen), a Canadian (Deborah Kara Unger) and an Irish writer (James Nesbitt) suffering from a bout of writer’s block. From the unexpected and amusing experiences along “The Way,” this unlikely quartet of misfits create an everlasting bond. All the while, Tom begins to learn what it means to be a citizen of the world again. Through Tom’s unresolved relationship with his son, he discovers the difference between the life we live and the life we choose. “The Way,” which is written and directed by Emilio Estevez, was filmed entirely in Spain and France along the actual Camino de Santiago. The movie trailer for “The Way” can be watched now below. How have you recovered from the loss of a loved one? This Hookup is simple! Just submit your comment below and we will award 30 admit-two tickets randomly via e-mail for our “The Way” Hookup. Winners need to arrive early as seats are consumed on a first-come, first-served basis. As advance screenings are overbooked to ensure a full house, winners are not guaranteed entrance and must arrive early. We recommend arriving 45 minutes before the start time. Winners are typically e-mailed our advance-screening passes two days before the screening date. Good luck! Submitted by JordanaRD on September 30, 2011 - 2:02pm. Submitted by sammiblinkchick on September 30, 2011 - 2:09pm. I don’t think you ever really recover, you just learn to live with it. You carry the loss with you everyday and try to remember the good times before the bad. Submitted by ronlipski on September 30, 2011 - 2:10pm. Submitted by crystala on September 30, 2011 - 2:24pm. No, I haven’t totally recovered from the LOSS OF MY DAD? Does one every recover? He suddenly and unexpectedly experienced a massive heart attack. I’ve managed to move forward but I have not totally recovered and not sure if I ever will. Submitted by wongsand on September 30, 2011 - 2:33pm. I don’t think you ever recover from the loss of a love one. You constantly think of them and they’re always in your heart. Yes, you can move forward but do you ever recover? I doubt it. Submitted by Pens929 on September 30, 2011 - 2:35pm. try to think about the good things and not the bad and eventually it dulls but never goes away. Submitted by goodscot on September 30, 2011 - 2:38pm. The best way to get over the lost of a loved one is to go on living every day as best you can because that is what our loved ones would want us to do. Submitted by dockster on September 30, 2011 - 2:40pm. Recovery is a subjective term. Do you go back to how you were Before? Never. Do you come to terms and move on? Yes - and that’s what’s happened in my life after I’ve lost a very dear family member. Submitted by Scott Marriott (not verified) on September 30, 2011 - 2:44pm. I don’t think I need to be over someone I’ve lost, but I do think you need to remember them for their best qualities/shared memories. Submitted by Anonymous (not verified) on September 30, 2011 - 2:44pm.